Join Daniel Pipes on a fact-finding mission to Poland, Hungary and Austria. For more information, click here. The following overview was written in connection with a Middle East Forum conference, “Qatar: U.S. Ally or Global Menace,” taking place in Washington, D.C. on Feb. 6, 2019. To watch it live-streamed, click here. Already in the mid-1990s, a playful riddle circulated among foreign-policy types: In the aftermath of the Soviet collapse, which are the world’s two great powers? Answer: The United States and Qatar. In other words, the outsized ambitions of a country with a native population then numbering about 150,000, have long been apparent. 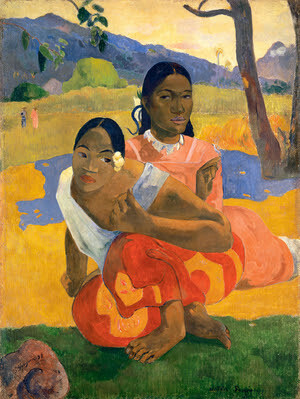 Paul Gauguin, Quand te maries-tu? These days, Qatar’s influence is no longer a riddle. It is felt from Claridge’s Hotel to Paul Gauguin’s Quand te maries-tu?, from Al Jazeera to the 2022 World Cup, from hacking efforts to bribery scandals. The government has flamboyantly balanced its external connections, symbolized by the giant Al-Udeid Air Base used mostly by American forces vs. the Qatar-Turkey Combined Joint Force Command.In part, this remarkable record is made possible by the unique riches showered on the country’s tiny population (which now stands at a bit over 300,000, or about 1 percent of the population of Shanghai). The vast North Dome gas field earns the country’s subjects (as opposed to the many more numerous foreigners) a per capita income of about US$500,000, or some five times higher than the second richest state, Luxembourg. In part too, Qatar’s outsized role reflects on the nature of the country and its leadership. As in Saudi Arabia, the extremist ideology of Wahhabism dominates in Qatar, bestowing its population with a sense of purpose and ambition quite out of proportion to its size. 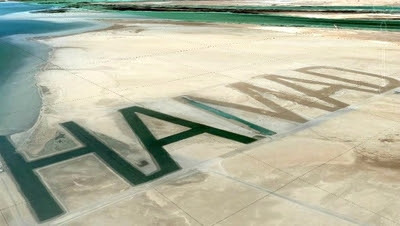 Its recent leadership, first Emir Hamad (r. 1995-2013) and now his son Tamim (2013-), as well as their relatives and aides, indulge in an evanescent grandiosity nicely symbolized by the HAMAD name (in Latin letters) stretching one kilometer high and three kilometers wide that Emir Hamad briefly and mysteriously had etched into the sands of an island in 2010, then no less mysteriously had erased two years later. The sand HAMAD in its full glory. Qatar’s reach is perhaps most evident in its reported support for jihadi groups in such varied places as Iraq (Al-Qaeda), Syria (Ahrar al-Sham, Jabhat al-Nusra), Gaza (Hamas), and Libya (Benghazi Defense Brigades). In addition, Qatar supports prominent Islamist networks all around the world – including the Muslim Brotherhood in Egypt, the AKP in Turkey and Jamaat-e-Islami in Bangladesh. In Doha, the government provides the Taliban with office space. Islamist luminaries such as the Muslim Brotherhood’s spiritual leader Yusuf Al-Qaradawi and Hamas chieftain Khaled Meshaal have for decades made their homes in Doha. In the West, Qatar’s power is more cautious and thrives unchallenged. For one, it funds mosques and other Islamic institutions, which express their gratitude by protesting outside Saudi Arabia’s embassies in London and Washington. But Doha does not rely only on the Islamist diaspora in the West to advance its agenda; it also works to influence Western policymakers and the public directly. The enormous Al Jazeera television network has become one of the world’s largest and best-known broadcasters. Its English-language stations produce slick propaganda against Qatar’s enemies, dressed up in Western liberal rhetoric. 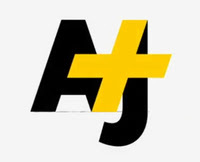 Al Jazeera’s latest venture – its social media channel, AJ+ – is aimed at young, progressive Americans. Its documentaries on the evils of Israel, Saudi Arabia, and the Trump administration are sandwiched between glowing coverage of transgender rights campaigns and emotional appeals for the plight of asylum seekers on America’s southern border – seemingly incongruous topics for a broadcaster controlled by a Wahhabi regime. Now that the Saudi, UAE, Egyptian, and other Arab governments have woken to the threat posed by Qatar, is it not time for Westerners to do so too? The Middle East Forum conference on Feb. 6, seeks to shed light on one of the world’s smallest, richest, most powerful, and most sinister states, by focusing on two questions: What is the government of Qatar doing? What is its goal?